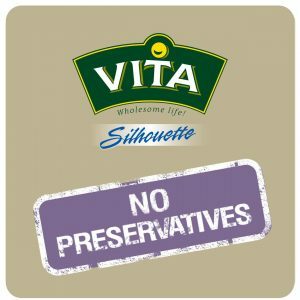 100% whole-grain diet Vita Silhouette bread varieties are a true ally in maintaining a beautiful and slim body, in a simple and effective way and make healthy eating a true pleasure. 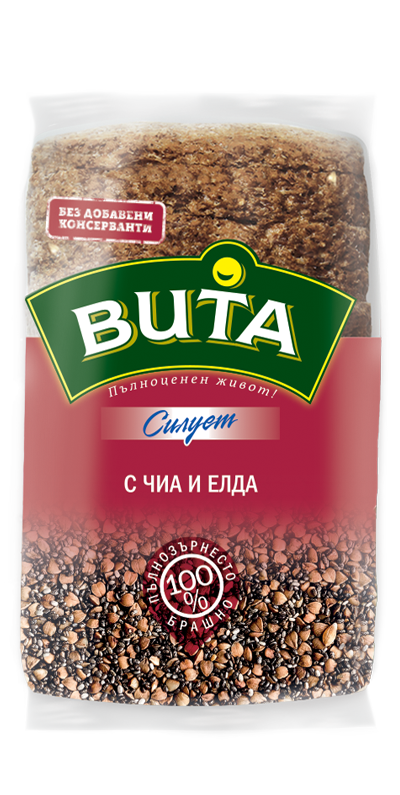 100% whole-grain wheat flour with added linseed, poppy seeds, sesame seeds, soy, sunflower seeds and oats, each of which has its signature taste and healthy benefits. 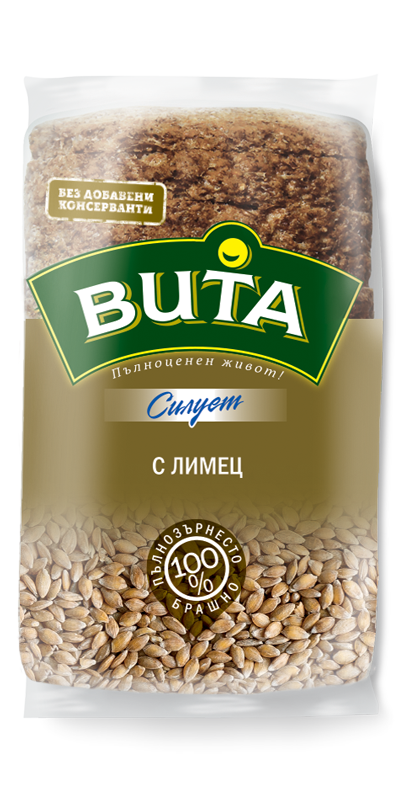 Dense, multi-grain bread with exceptionally rich taste and texture. 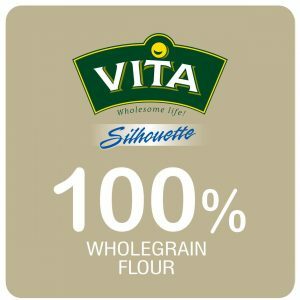 Whole-grain flours – 59.3% (whole-grain type 1850 wheat flour – 90%*, whole-grain type 1750 rye flour – 10%*); water; starter (water, wheat meal, liquid malt extract, clean starter cultures); sea salt; poppy seeds – 1.1%; linseed – 1.1%; sunflower seeds – 1.1%; oats – 1.1%; sesame seeds – 1.1%; soy mix – 0.8% (coarsely ground soy – 40%, whole-grain wheat flour); bread yeast; dark malt flour; technological additive (fermented wheat flour; antioxidant: ascorbic acid; enzymes). 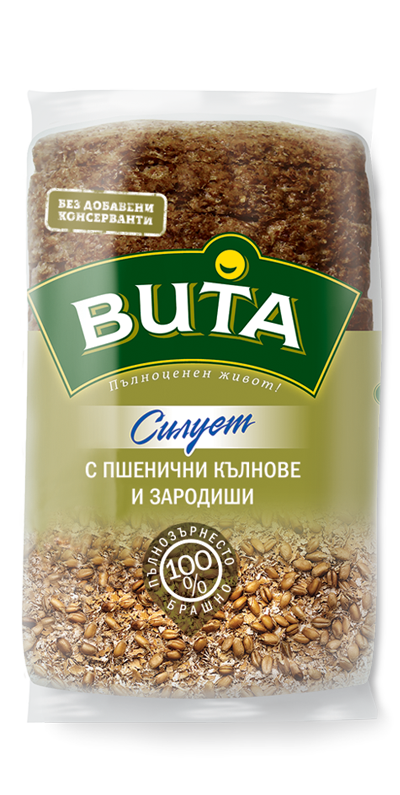 50% whole-grain einkorn flour combined with the soft taste of whole-grain wheat and the signature flavour of whole-grain rye for a perfect balance between taste, texture, healthy benefits and natural origin. 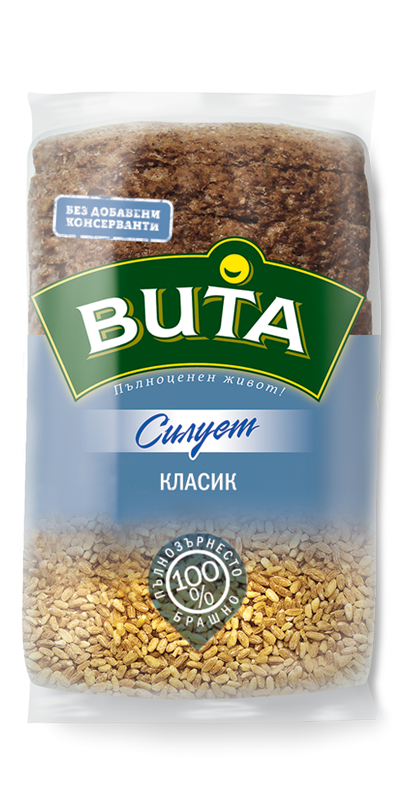 The high einkorn content makes this bread variety very suitable for those willing to reduce gluten consumption. 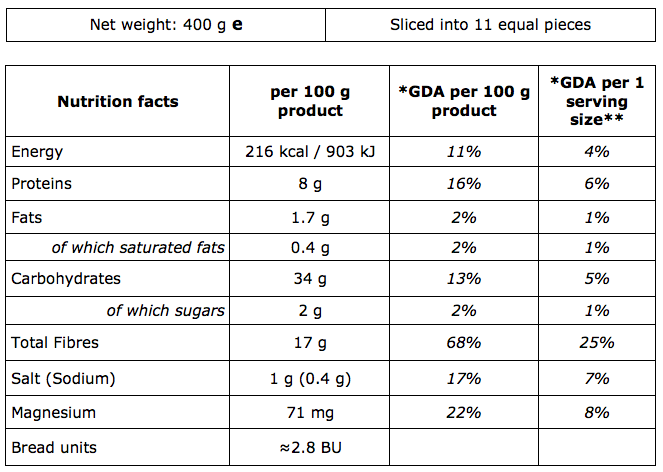 Whole-grain flour – 65.5% (whole-grain einkorn flour – 50%*, whole grain type 1850 wheat flour – 40%*, whole-grain type 1750 rye flour – 10%*); water; starter (water, wheat meal, liquid malt extract, clean starter cultures); sea salt; bread yeast; dark malt flour; technological additive (fermented wheat flour; antioxidant: ascorbic acid; enzymes). May contain traces of: soy, sesame seed, oats, walnuts milk and its derivatives. The product does not contain GMO. Whole-grain rye flour with added whole sprouted rye grains for added character, taste, flavour and density. This bread variety is not only tasty, but also a unique option for people willing to lose weight or having problems with their metabolism, because, in contrast to wheat, the rye grains raise the blood glucose more gradually and for a longer period of time. 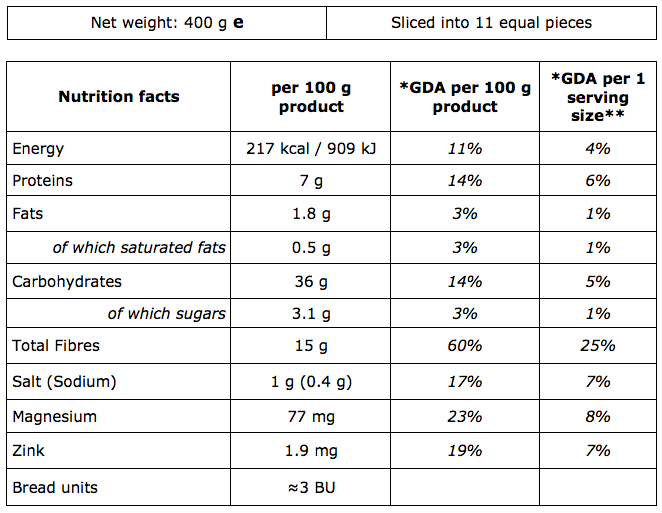 Whole-grain flour – 65.2% (whole-grain type 1750 rye flour – 70%*, whole-grain type 1850 wheat flour – 30%*); water; soaked whole rye grains – 8% (pasteurised rye starter, rye grains – 35%, iodised salt); sea salt; bread yeast; dry starter (pregelatinised wheat flour, citric acid, heat-treated wheat flour, maltodextrin); liquid malt extract; wheat malt flour; technological additive (fermented wheat flour; antioxidant: ascorbic acid, enzymes). 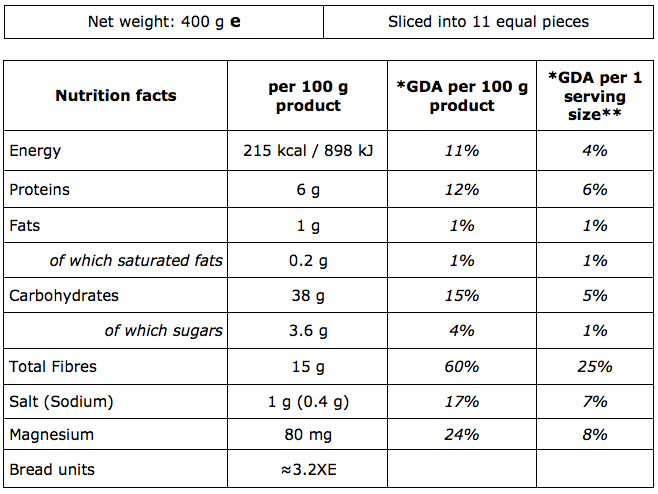 May contain traces of: walnuts, soy, sesame seeds, oats, milk and its derivative products. The product does not contain GMO. 100% whole-grain flour with added chia and buckwheat. 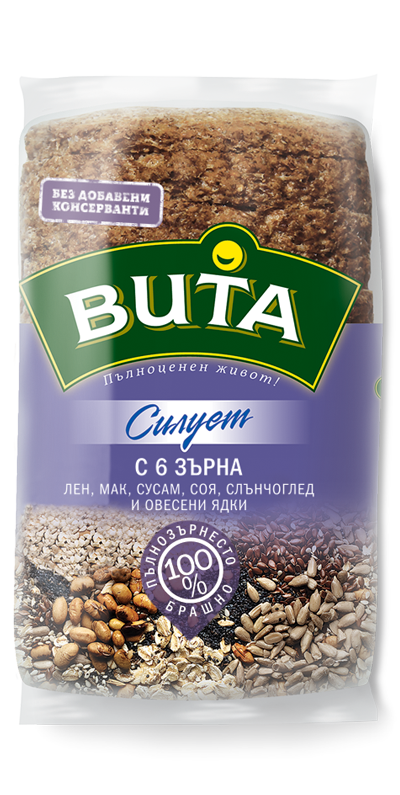 With the perfect balance between the healthy benefits of the whole grains and the exclusive properties of the chia seeds and buckwheat, this combination is the ideal way to add valuable nutrients to your diet and maintain a healthy weight and slender silhouette. 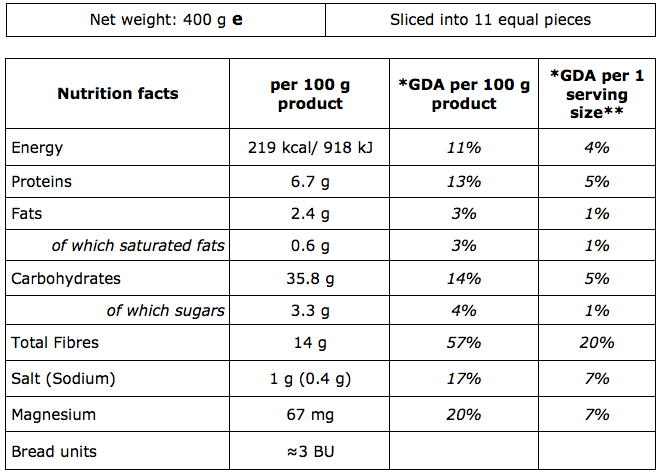 Whole-grain flour – 58% (whole grain type 1850 wheat flour – 90%*, type 1750 whole-grain rye flour – 10%*); water; starter (water, wheat meal, liquid malt extract, clean starter cultures); buckwheat – 5.1%; chia – 5.1%; sea salt; bread yeast; technological additive (fermented wheat flour; antioxidant: ascorbic acid; enzymes). 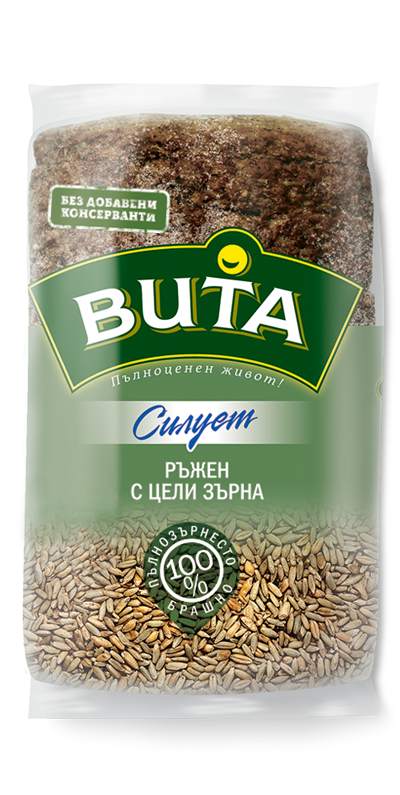 Made entirely from whole-grain wheat and rye with added wheat germs and sprouts, which enhance the healthy benefits and taste of the whole grains and stimulate the vitality of the body. This bread variety is very rich in natural fibres, which accelerate the metabolism and contribute to better health and fit shape. 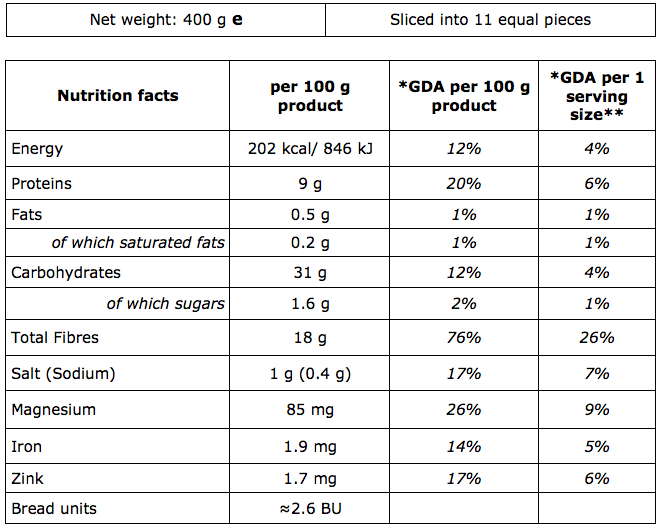 Whole-grain flour – 60.7% (whole-grain type 1850 wheat flour – 90%*, whole grain type 1750 rye flour – 10%*); water; starter (water, wheat meal, liquid malt extract, clean starter cultures); wheat sprouts – 4%; wheat germs – 2%; sea salt; bread yeast; dark malt flour; technological additive (fermented wheat flour; antioxidant: ascorbic acid; enzymes). Made entirely from whole-grain wheat and rye flour with added crushed wheat grains for a richer taste and texture of the bread. A wonderful combination of the dietary and healthy effect of the natural fibres and the exceptional nutritional properties and flavour of the bread. 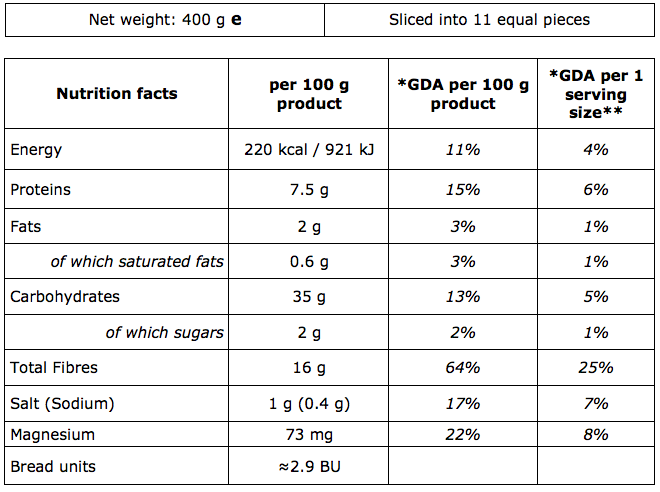 Whole-grain flour – 64.4% (whole grain type 1850 wheat flour – 90%*, whole-grain type 1750 rye flour – 10%*); water; starter (water, wheat meal, liquid malt extract, clean starter cultures); sea salt; bread yeast; dark malt flour; technological additive (fermented wheat flour; antioxidant: ascorbic acid; enzymes).